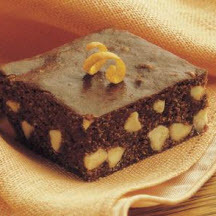 Orange-scented, cocoa-infused graham cracker brownies studded with white chips. Preheat oven to 350°F (175°C). Grease 9-inch square baking pan. Stir together graham cracker crumbs, cocoa and orange peel in medium bowl. Stir in sweetened condensed milk, water and white chips until well blended; spread batter evenly into prepared pan. Bake 25 to 30 minutes or until top springs back when touched lightly. Cool completely in pan on wire rack. Cut into bars.